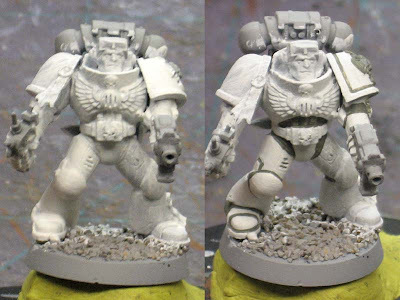 Today we're going to take a look at using a light colored primer and how that affects painting your model. 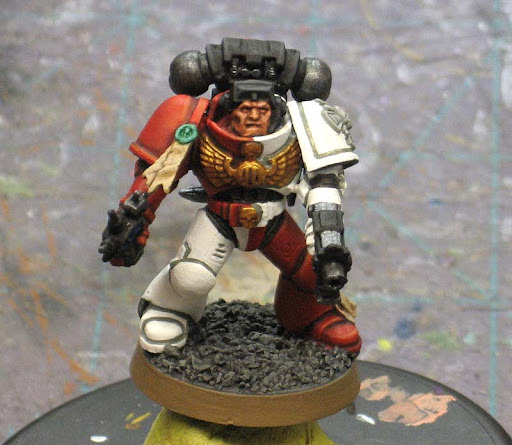 Using a Space Marine as our example, I'm going to paint him in a quartered scheme to show you both white armour and a regular middle value color like red. I'l be sticking to simple techniques like base coating, washing and highlighting. Nothing fancy like wet blending or any other "advanced" techniques. I've broken the process down into individual steps in the order they are done in to show you how to do each part and then why certain things are done before other. This is a huge post, but there are lots of good tips throughout. Note: We are going to work through this model in deliberate steps in a specific sequence in order to make it as easy as possible. If we had started someplace else, say with another section of the model, it might make it difficult towards the end. We are going to work from the inside out and from dark to light in colors. Working from the inside out means you paint the chest plate armour before you paint the eagle on top of it. Working from light to dark allows you to constantly fix and clean up your previous step with your current work. You'll see as we go along. I'm also using a variety of colors from a bunch of different paint lines. Where it matters. I've mentioned the specific color I used. Other than that, you can substitute your own colors to get the results you like. There are lots of primers out there... and lots of different colors to choose from as well. For this example, we're going with a light grey. It's my "light" color primer since it allows me to paint over it and my lighter, transparent colors remain bright and don't require a thousand coats to cover completely. 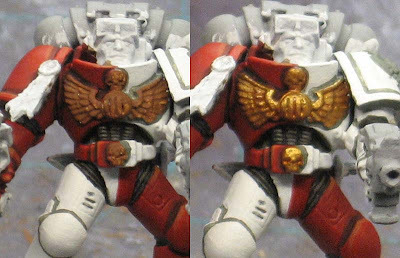 The reason I use a light grey and not white is so that I can see the details on the model. I've found that if I prime something white, I have trouble finding and keeping track of all the details. The grey is still light enough that it doesn't have an impact on my lightest colors, but it allows me to see all the details without being washed out. We start with painting our white armoured areas white. Because we used the light grey primer, it only takes a couple coats and you don't need to be clean either, just get the area covered. You want a smooth, clean finish here but don't worry if you get white on other areas at this point. Once you get your white down. Go in with a fine brush and shade the recessed areas. Try and be neat, but if you make a mistake, there's no need to worry... you just go back with some white paint and clean up your lines. You want to shade all the recesses in the white area with your middle value grey color. At this point, paint all of your flex fitting areas (elbows and knees) with your grey color as well. 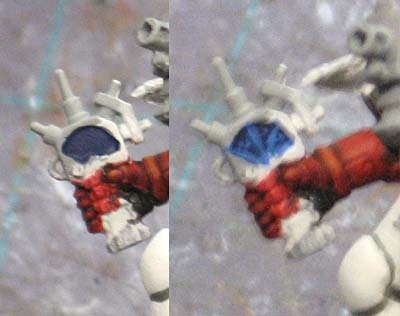 TRICK: This is a quick way to paint white armour. Instead of painting the model dark and trying to work all of the armour plates back up to white, paint it white and just go in and pick out your recessed areas. You can always go advanced later on and add subtle shading to your armour plates after you have the recessed areas done. Time to move onto the red. Like I mentioned, this is a quartered scheme so now we pick out the panels that are going to be red. Again, it only takes a coat or two until you have a nice smooth finish. Once you have your red areas based (Step 1), you can move onto shading them (Step 2). Using GW Devlan Mud wash, paint it into the recessed areas similar to how you painted the grey into the white areas in the previous part. Get the wash into the wrong spot? No problem, simply clean it up by using your red base color. 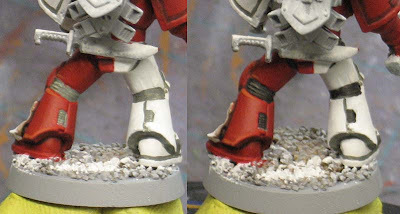 Step 3 is a simple line highlight on the red areas. With our white and red armour done, it's time to move into some detail areas. Since the flex fitting joints were already painted with the grey color we used when we lined our white armour, all we need to do now is go in and add a quick wash to them. In this case, I used P3 Armour Wash. It's considerably darker than the GW Badab Black wash and I can get the same result with one pass. TRICK: If you want your flex fitting areas on your model to be black with light grey highlights, don't kill yourself trying to line highlight each rib in the joint or trying to drybrush that tiny area. All you need to do is paint it a middle value grey and go back and wash it with black. The wash falls into the recesses and you're left with a black looking joint with light grey ribs. Up next is the gold areas on the model. Remember how we painted the chest plate armour first, now we can go it and paint the chest eagle that's on top. I start with a warm brown color. Two reasons... first, it allows me to get a uniform color over the whole gold area in the event I miss a portion with the gold paint and second, it allows me to thin my gold paint slightly so it's not so thick since it's a metallic (I use GW Shining Gold). Basecoat the gold area brown, thin your gold and paint it on and finish the whole area with a wash of GW Gryphonne Sepia. The crux on his shoulderpad is nothing more than a simple line highlight. We basecoated it with our grey when we were lining our white areas. Just take a lighter grey and go in a carefully pick out the details. You could drybrush it here since there is plenty of texture, I just think a line highlight is much cleaner and better looking. Moving onto the purity seals. With all of our armour and armour elements (crux, chest eagle) done, we can move onto the elements that sit on top of those. 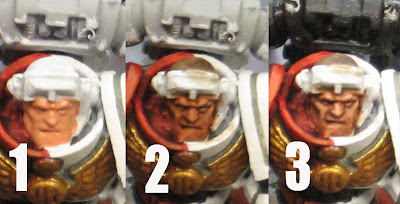 Basecoat the paper portion with a light tan color (Step 1), give it a quick wash of GW Devlan Mud (Step 2) and then go back with your base color and add some highlights (Step 3). 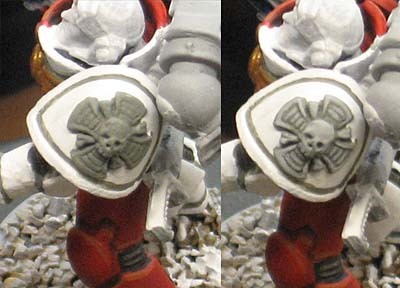 The seal itself is done in a contrasting color to the red armour. I did not use a pure green since I wanted to avoid the "Christmas tree" effect and went with a blue-green color instead. With the paper portion done, basecoat the seal (Step 4) and then give it a wash (Step 5). If you use a light color for your seal basecoat, there should be no need to go back in and highlight it. TRICK: In oder to make your purity seals and other spot colors really pop on your model, try using a combination of colors. For example a light green basecoat with a blue wash or an orange basecoat with a purple wash. By using a different base color and wash, you get colors that aren't commonly found and catch people's attention. Try and get away from the red base color with the red wash over it. The Auspex. This model has one, so we're going to deal with it now since we are at the point of finishing up the model. Before we paint the whole Auspex, we're going to go in and paint the face on it. It's nothing more than a blue basecoat, some light blue lines and then a wash with GW Asuremen Blue to tone it all down. TRICK: Paint the face of the device before painting the outside. It means you don't have to worry if you get paint on the body of the Auspex since you're going to paint that in a minute anyway. And onto the model's face. We aren't painting eyes here, we're just going to suggest the features on the face with some simple shading and highlighting. Start with your basecoat (Step 1). I'm using GW Dwarf Flesh, but any tan would work. If you decide to use something other than a "tan" color, you might want to adjust your washes. Give it a wash with GW Ogryn Flesh followed by a wash of GW Devlan Mud in the deepest recesses only (Step 2). Finish the face by going back with your base color and highlighting the top areas like the cheekbones, forehead and nose. Now it's time to pull it all together. Now we get to use black. We're going to paint all of our metal areas and in this case, things like his backpack, gun casing, goggles and auspex. You can also go in and clean up areas like the underside of the shoulderpads if you want. With your areas picked out in black, you can take your "metal" color and basecoat those. I went with a darker silver in this case instead of a bright one, either works, it all depends on what you want your final model to look like. With your metal basecoated, give the areas a quick wash of GW Badab Black to tie it all together. And one last thing is to add a dark grey line highlight to the uppermost edges of your black portions. Just something to break up the space and show some features. And last but not least, the base. I kept it simple as well. Your basing will vary, but the idea is the same. It's given a dark grey basecoat (Step 1). Follow that with a wash using three colors for variety: GW Devlan Mud, Ogryn Flesh and Gryphonne Sepia (Step 2) and a quick drybrush with a light grey once dry. The three washes are for variety and can add some life to an otherwise dull base. Step 3 is to trim the edge with GW Graveyard Earth. 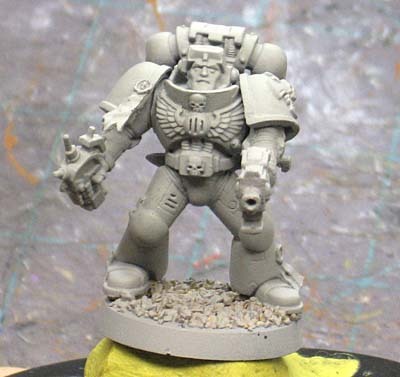 TRICK: Want your light colored model to stand out from his base, make the base a dark color. And the opposite is true... to make your dark colored model stand out, put him on a light colored base. And if you trim out your base edge with GW Graveyard Earth, it will look like a GW model since that's what they use to trim their models with. We haven't covered anything like battle damage, weathering or freehanding here, The idea is to show you how you can paint a model starting with a light colored primer and use that to your benefit. Hopefully this has helped and please go check out Dave's model that he's done using a light colored primer as well. 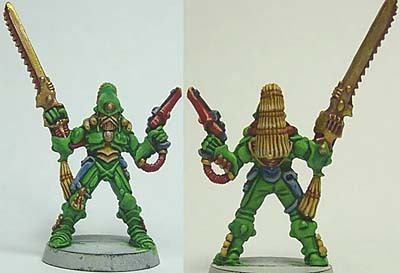 He's done a great job of showing the steps to painting an Eldar Striking Scorpion model. When I loaded my picture into my photo album, it mistook the model's face for a real one and asked me if I wanted to identify the person in the picture. AutarchAndrew: You don't see many of them around, the Chapter is so small. Actually, I chose them to match a color scheme I was given for another project and they're two colors people will shy away from. Perfect for this example I thought. Makes me want to paint one just to see what results I myself would get:) Nice clear, and I especially like the tips sections. A nice clean marine like that would not look out of place on a table top. Quick tips for the purity seals that I think would benefit the readers. Get a small tipped pen (micron or something, google to find out more) and draw "text" on the paper before the wash. Super simple and adds a little. And the only thing I felt missing:) Other than that it looks great. Oh, and I hate graveyard colored sides on bases. :) GW has a nice big page on bases though that I can recommend. Lots and lots of ideas there. Don't have a link now though I'm afraid. Flekkzo: Line highlights, got it. I can go into them a bit more next time. Excellent tip on the purity seals. I opted to leave it out in this post for simplicity and tried to stick with paint and brushes. Once you open the door to additional techniques and tools, it's a flood of options to choose from. Excellent tutorial Ron- consider this bookmarked! I've been using white primer for most my models for awhile now. I've been working on a HalfnHalf scheme for a new chapter but i'm tempted to go quartered now. 4. repeat step 3 as aften as needed. The recesses will color darker then the rest of the model creating high and low spots for you. I did most of a Dark Angels battle company this way. Apply a wash over an assembled squad before I went to bed and then again in the morning before I went to work. When I got home from work I would apply another wash and start cooking dinner. Once that squad was done washing I started working on the details and began washing another squad. I always had one squad being detailed and one on the back of my table drying from the wash. great for when you dont always have time to sit down and paint. Well? What did you name him? Max: Excellent, nice to know it's worthy. madtroll: I love the idea of painting with washes. I started practicing with my Dark Angels army and you can get some great results. Joe: Hadn't thought about it, but I suppose it would be "Doug" since that's a running joke in my house. Excellent guide. Gives new ideas how to paint quartered scheme etc..
And nice color choices, I've been wanting something similar for my marines, only problem I'm still facing is that what color would suit tabards/loincloths and such..
Mika: You could go with a light tan with darker tan shadows for an overall warm look or go with white and use a light grey for the shadows for a cooler look in the end. I think I might take one of my AOBR models and paint it to this theme just to see how close I can get to your theme. What primer do you use by the way I noticed you said it was grey? Servvs: The primer I use is made by ColorPlace (the cheap stuff) and is called "Equipment Grey Primer." The can is blue with white lettering on it. Is that something I can buy at a local hardware store or whatnot? I like the army painter primer but I don't see something that represents that color. I'm an extreme newb at this whole painting thing so I appreciate the help. While I have you any suggestions for matching that elusive "Blood Ravens" chapter color? I've been using black primer with mechrite (thinking about trying a white instead) with bleach bone for the parchment. I'm in the States on the East Coast, so I pick mine up at Walmart. If you Google color place spray paint and look at Images, you'll see what the can looks like. I use black sometimes... but the majority of my priming these days is done in the light grey color. I almost never use white unless it's a white armoured model. 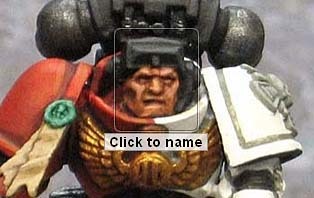 As for Blood Ravens, let me look around to see what I can come up with. I know they too have a unique shade of red. I definitely agree with the bases colour scheme. I see so many miniatures that get lost in the base. Choosing the same colour and/or depth of colour can go from a nice contrast to basically camouflaging the mini. D'oh! I could just spray them white, and then wash them with Badab black, and this will give me that needed contrast so I can see where to paint. How do you get a nice finish to a white paint job? I have been told to do many thin coats to compensate for the lack of opacity inherent in white paints, but they seem to come out a bit chalky when I do it. Any ideas? Personally, I think the chalky white effect comes when we try and get s super nice finish and then have no variation to the white area. There's no real shading or highlighting and it just falls flat on the model. The white areas on my models aren't really white. They come close either with a light tan or light grey (warm or cool) and then I highlight with white to make it look the part without actually being white. It fools the eye and still has some variation to the colors so that doesn't appear flat. So you do the centre of, say, a rectangle white, but then the closer it comes to the edges, the more tan/grey is in showing through? 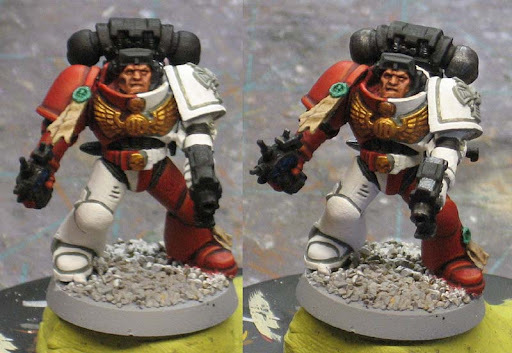 Sort of... you'd have the grey or tan base and then you would highlight up to white where you wanted your highlights to be on that particular spot on the model. The light grey/tan is left where the shadow would be on the model.